You are a complete One Piece fanboy. Well admit it, i know you are like me. You have watched the anime series and even read the manga. You browsed this website for theories to take your understanding of One Piece to the next level. Now, it’s time for you to become a Straw Hat. Coz this is a One Piece Burning Blood Review. Well, i must confess something. I have done something quite embarassing and i think you may have too. After hours of watching One Piece, i fought with my friends, and i even used gear second. In real life! And the funny thing is i ‘m not 12, i ‘m almost 24 :P! What is the solution to this childish behavior? Well, more childish behavior! Yes, playing video games is a solution that will keep you and the people around you safe from a gatling gun :P. They will also probably make you saner. All the One Piece energy you have inside you will be used playing :). The newest video game of the One Piece franchise has arrived to help us fill the need for fighting each other. And it has incorporated some new interesting features, to make us stay at the edge of our seats, all time long. Just to give you an idea, the story of the game starts at Marineford. You are Monkey D Luffy and you are trying to rescue your brother Portgas D Ace. This battle serves as a tutorial, to help you learn some basics of the game. Also, the game continues on with the two year timeskip. In general, the game follows the anime story to the letter, so no reason to expect any plot surprises there. Wanna try the devil fruit abilities of our favorite characters? Try special attacks and reinforce them while being unleashed! Prepare to get mind blown with 3 vs 3 character battles. Also, be ready to take strategic decisions, cos it won’t be just fighting this time. Either use your logia devil fruit to change the shape of the battlefield, or simply guard against physical attacks. Anyone dreamed of becoming fire like Ace? Well, here you are. Getting bored of these damn devil fruit users? Use your haki to break their logia guard at the right time, and unleash havoc bro. That is the main feature that distinguishes One Piece Burning Blood from the previous One Piece games. The gameplay is not centered around devil fruit eaters anymore. Many new haki characters are now playable in the new game, which signals essentially the transition to the New World era. Which brings us to the next topic. There have been announced in a recent issue of Weekly Shonen Jump and VJump as well, that the new game will feature 42(!) playable characters. I won’t bore you with details, so here is the list to check it out. 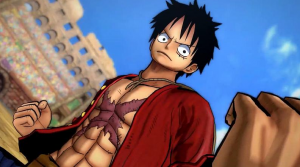 There are many stages that you can pass while playing One Piece Burning Blood. Ever dreamt of taking part in the Marineford war? Or wanted to come aboard the Thousand Sunny? Swim underwater and reach Fishman Island? Get a glimpse and more of Dressrosa? Or even visit the hometown of Tony Tony Chopper, Drum Island? All possible in One Piece Burning Blood. What i enjoyed a lot with One Piece Burning Blood, is the art style it has. The developers have tried to get as close to the manga as they can. That, has created an atmosphere really manga-like. In general, there is a lot of attention to the detail, regarding the characters and the whole game, which is certainly a pleasure for all the One Piece enthusiasts(like us :P) that are out there. Well, i will be honest with you. If you are a fighting games’s lover and just want an unbelievable fighting game you won’t find that here. One Piece Burning Blood is far from perfection. You can go a lot better playing the top games of the category. But, if you are an One Piece lover and just want to have fun with your friends or just beat the One Piece villains yourself, One Piece Burning Blood is just what you are looking for. The best fighting game ever? Not at all. It isn’t without its flaws. The best One Piece fighting game? Yes, probably one of the best. The thing is you didn’t come here for the features or the game summary. I know you can find these elsewhere but i wanted to be thorough, so i laid out what i found most important here. After all, this article is a One Piece Burning Blood Review. What is important though is that you came here to find a sincere opinion on this simple question. Should i buy One Piece Burning Blood? The answer is simple as well. If you want the best video game that is at the market right now no. Simply don’t buy it. 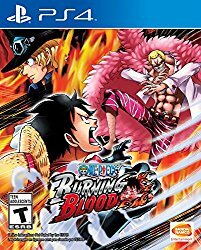 If on the other hand, you want a quite decent and beautiful, full of action game centered around One Piece, then by all means go for it and buy One Piece Burning Blood! So you’re an anime fan, that’s cool. I’ve heard of One Piece, and it’s intrigued me, like other anime has. Have you ever watched other shows, like Hellsing or the Vampire Hunter D films or the Cowboy BeBop TV show? I don’t know if they have game versions, like One Piece does, but they’re very interesting entries in the anime genre. One Piece seems like a different type of anime show from those, though. If you’re someone who enjoys more serious or adult anime, like the ones I mentioned above, would you recommend One Piece to that kind of viewer, or should they steer clear and try something else? Hey Hilton. Glad you are an anime enthusiast as well. I like adult anime like those you mentioned, my favorite being Code Geass. I would definitely advise to watch One Piece if you like adult anime but with a caveat. It is more childish in humour(which is really nice when you get familiar with it) and more slow paced, having a lot more episodes. You can find the best place to watch One Piece check here 🙂 http://onepiecetheories.com/watch-one-piece-what-is-the-best-place. 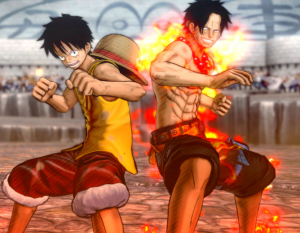 Great review on one piece burning blood, I haven’t heard any ones opinion on this so it was good to get a clear honest review to help make my mind up, I have decided I am willing to buy and try it even though its not the best on the market, thanks for the helpful information. I never really watch one piece but I am big naruto and fairy tail fan. I love what you did here. Next Next post: One Piece Admiral Fujitora – Friend or Foe?